Brown-banded carder bee (Bombus humilis). Photo credit: Ray Reeves. 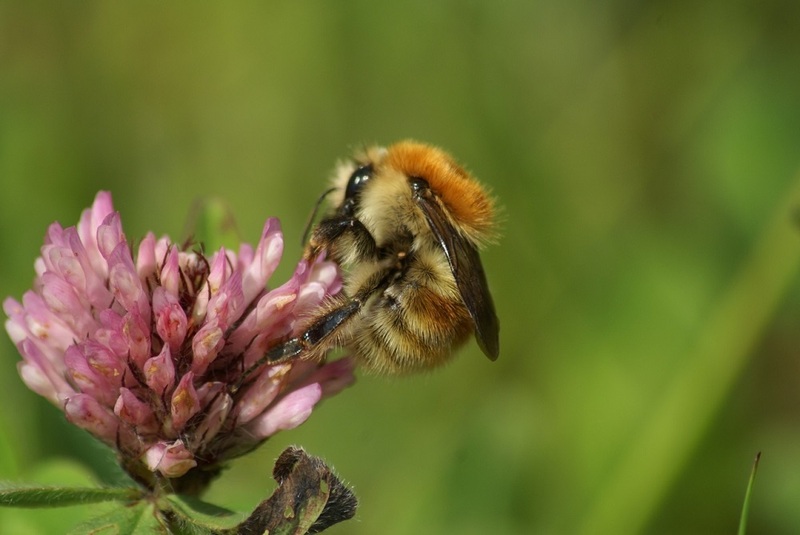 The scarcest of the three all-ginger carder bumblebees, it is found in open flower-rich grasslands in the south of England and Wales where it shows a strong preference for clover, knapweed, red bartsia and similar flower species. Males, workers and queens are similar in appearance, ginger-brown all over with no clearly-delineated tail, often with a darker brown band on the second abdominal segment. Brown-banded carder bees. Photo credits: Paul Larkin (left), Krisz Fekete (right). Only three species (Common carder, Bombus pascuorum; Moss carder, Bombus muscorum; and Brown-banded carder) are all-ginger, and consequently the trio can be easily split off from other bumblebees. A few others (notably the Great yellow bumblebee (Bombus distinguendus) and the Field cuckoo bumblebee (Bombus campestris) can look unicolorous, but these are yellow, rather than ginger, and always have a dark bar between the wing bases. Separating the three ginger carders can be considerably harder. The Brown-banded carder bee has no black hairs on the abdomen (unlike the Common carder), and does have a thin scattering of black hairs in amongst the ginger around and above the wing bases (Moss carder has no black hairs on the abdomen or the thorax). The brown abdominal band that give the species its English name is variable in appearance and is not a reliable feature to split the species: the Moss carder bee often shows a yellowish band and the Common carder a darker band here, while the brown band of the Brown-banded carder is often not easily visible. Males can be separated by their genital capsules.